“The Bears!”. Lucas Oil Stadium was a rockin’ and a rollin’ Sunday night in Indianapolis. The amoeba of middle-aged losers wearing beads, face-paint, and blue wigs were screaming and shouting so loud before kickoff, the synthetic noise that needed to be piped into the RCA Dome to compensate for the pathetic fans’ lack of enthusiasm wasn’t even needed. The pageantry, good vibes, and rock concert atmosphere was felt and enjoyed by all, except the visiting Bears, who decided to crash the party and poop in the punch. When all was said and done, the heavily favored Colts sat around licking their wounds as the Bears celebrated an opening week, 29-13 victory that was simply dominant on both sides of the ball. Call Peyton Manning “rusty” all you want, but the bottom line is simple: The Bears outhustled, outplayed, and ultimately beat an overconfident opponent. Quarterback Kyle Orton did EXACTLY what he needed to do, which was protect the ball, and deliver a few big balls on 3rd down. He looked very mature against a tough defense on the road, and passed his first test of ’08 with flying colors. The offensive line did an outstanding job of protecting Orton, and helped establish a potent running game early that lasted for 4 quarters. The penalties were non-existent, and optimism that points can (and will) be scored is the highest it’s been since ’06. Rookie running back Matt Forte stole the show, and displayed a burst of speed that few knew he possessed. When the smoke cleared, he compiled 123 yards, had a 5.3 YPC average, and showed flashes of Neal Anderson during a 50 yard touchdown scamper. This kid has a serious set of wheels. Cedric who? Tight end Greg Olsen looks ready for the big time. Orton needs to look for this fast, athletic, sure-handed receiver on third down often this season. With the receiving corps in shambles, Olsen needs to be a key weapon in the passing game. What can I say, they were SICK. The speed is back, and guys were flying all over the field making plays. The linebackers did an excellent job containing the Colts’ running game, which didn’t happen in Super Bowl XLI. Indy was held to just 53 total yards rushing. The highlight was a blistering hit on Joseph Addai that knocked him out of the game, and that Bears swagger we love so much was back last night. Kudos to Tony Dungy for going for it on 4th down, literally challenging the hungry Bears defense to make a stop. It was the equivalent of slapping a drunk Mike Tyson. The defensive line bullied Indy’s o-line, and managed to hit Manning numerous times, and register two sacks. DT Dusty Dvoracek played feverishly, and the push up front let Brian Urlacher and Lance Briggs roam free. The ends also chipped in, with Adewale Ogunleye turning in a stellar performance. The secondary was in synch, surrendering only a few big plays to the Colts’ vaunted passing game. Mike Brown’s return is a godsend, and I will continue to hold my breath (like every year) as the weeks go on. The strip of Marvin Harrison that led to a Briggs touchdown was the only scary moment, for many feared Harrison would pull out a gun afterwards. Luckily, his pistol is safely tucked away in a Philadelphia police station’s evidence locker. Gould made his kicks, Maynard made his punts count, and Hester’s presence ensured good field position on kickoffs. Chicago’s kickoff team did a remarkable job keeping the Colts around the 20. All in all, it was an impressive win. The Bears surprised many people, and hope for a winning season could be sparked by a victory this week in Charlotte against the Panthers. For now, I’m just going to enjoy the win, and run out to get a Forte jersey. 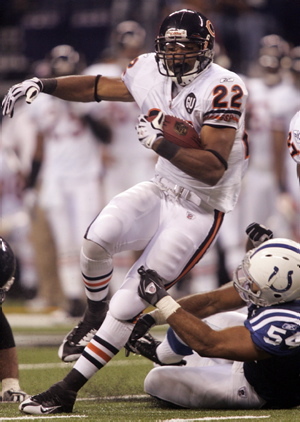 The last Bears running back jersey I owned was Curtis Enis…….on second thought, I’ll stick with my Kruetz one for now.